Quick! I need to figure out fast how to put Henry on my health insurance plan. Apparently, in my ongoing effort to maintain the standard of living in which this Cavalier King Charles Spaniel has become accustomed, he’s costing me a fortune. So I’m wondering, can I claim him as my spouse or partner? After all, he does tend to nag me a lot. 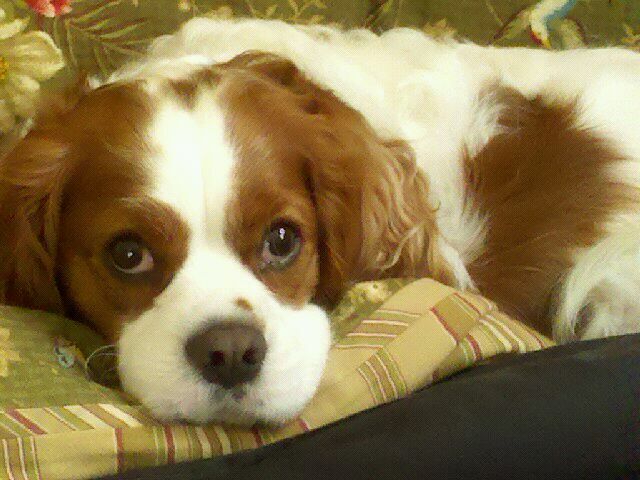 Yes, my Cavalier King Charles Spaniel is high maintenance and très demanding when it comes to matters of health. The way I see it, if I can’t figure out how to add him to my plan, then I may need to take out a second mortgage on my home. One recent Saturday morning, while Henry and I were on our usual morning constitutional, I saw red. And by that I mean, I saw blood in his stool. Naturally, I panicked, pretty sure it was a sign of impending doom. Driving like a mad woman to the veterinarian’s office, I was sure the end was near. Luckily, the receptionist knows just how important this little fellow is to me, so despite being completely booked, she squeezed Henry in right away. Which means, about two hours later, it was Henry’s turn to see the doctor. After all, time was of the essence. The vet, leaving no stone unturned in his attempt to discover what was wrong with Henry, determined that my dog was 10% dehydrated. Ten percent. How could I have let it get this far? Not sure, but I figured that the lack of water must have gone straight to his tail, because it was slumped down like a wet pig down his backside, curled underneath him with no plans to wag anytime soon. Not wanting to take any risks, for the next hour, Henry was put on IV, with a special supply of liquids that resembled Gatorade. I was sent home with a case of veterinary approved dog food, to keep him “regular,” and three different medicines—including antibiotics—to be taken for the next two weeks. The cost for all this? A mere $469. And when the results came back what did he have? Not much, but a momentary lapse in good health. Turns out, my Henry is a survivor! Fast forward three weeks and it’s time for Henry’s annual physical and shots—Distemper/Hepatitiis/Parvo, Bortadella and Rabies. Overall, Henry gets a clean bill of health, although the doctor does see telltale signs of gingivitis, tartar and, perish the thought, periodontal disease. Which is why, the doctor says I must bring him back early next year for an all out cleaning, which involves having to put him under. Projected costs for a teeth cleaning? About $300. Cost for the physical? $160. It would have cost an additional $80 if I’d said yes to doing a blood panel, but I figure we’ve seen enough blood for one month. I know some people have two or more pets, and frankly, I don’t know how they do it. It’s all I can do to stay afloat with just Henry. Which is why I’m in a medical pickle. Next time open enrollment comes along at work–and I think it’s coming up soon–I’m going to sign him up. Maybe, I’ll list him as my dependent, which technically is true, for I’ve yet to see the boy nail a job. Yep, that’s what I’ll do. He’s my son. Yeah, that’s the ticket. Monica, but seriously, who can resist a handsome face like Henry’s? OMG, is our boy a handsome devil! I’m seriously going to print this photo of him and place it on Roxy’s night stand! hee hee! Girl, what won’t we do for our furry friends? I shelled out 150 euros, chica, not dollars, euros, which with the way the currency stands, is about 206 bucks on shots alone and a check up! Are you kidding me? I don’t spend that much on shots for the Son! I’m glad Henry’s on the mend. I would hate for anything to happen to my son in law! hee hee! Bella, I think it’s time we bring these two love birds–er–love dogs, together. Maybe, dinner for two at a nice litte Italian restaurant? A plate of spaghetti, a la “Lady in the Tramp”? What do you think? Henry and Roxy…Romance is in the air! I just adore Bella and her “ranting” ways. $3,500?? Wow. Better keep the dental floss in a cabinet. Bells, no one deserves it more! Poor Henry, poor you. I have been there — knee surgery, stomach problems, arthritis, etc. It was even worse when I had two dogs at the same time. But looking at that face in the picture, it’s worth every penny. Yep, my Henry knows how to pour on the charm. He’s quite a catch. You should probably include him in your will and trust too! I just received notice of an upcoming training called Estate Planning for your Pets. Seriously! Sounds like I better sign up! Along with my three 2-legged kids, I have 2 of the four-legged variety (still fairly young cats) – they’ve been healthy so far, this post scared me, heck one of my kids still need braces and I’ve two college bound soon – I may have to add the two furballs to my health insurance too! Hope Henry is doing better! Thanks for stopping by from LBS! We need to get a petition going–pet health care for all! In lieu of that, pray our adorable pets never get sick. Yikes! For both of your sake, I’m glad he’s doing better. I know. If only. I would save so much. Oh, well, he’s got a face that could launch a thousand ships and he’s all mine. So, bring on the vet bills! He’s gorgeous. You may have to get a part time job at the vet or try bartering a service to cut the bill a little. I have a friend who bakes and it works for her. It’s really too bad we can’t enroll our pets on our insurance. They’d probably end up costing less in the long run that our children or spouses. Perhaps the insurance companies are just discriminating against people without spouses or children to support. I have a dog and a cat and I cringe when they need to go to the vet. My cat was throwing up daily and losing weight and after every blood test imaginable, the results came back that there was nothing wrong with her. My vet calls her bulimic kitty. And go figure, even with all the throwing up, she has the teeth of a two-year old cat. (She’s 10). You’re smart to do so, but having a dog in the family is well, wonderful. Lots of work, sure, and lots of dough, but the affection, the love in their eyes, that’s priceless! Way to go….thanks for making me now paranoid about “Henry’s Country Vacation” next week! I do promise to look at his poop closely every day 🙂 And to keep him hydrated. Just make sure to leave me the Vet’s emergency number!!!! No need to be paranoid. He’s in fine health this week, now that I’m keeping him in a bubble. You’ve heard of the boy in the bubble? Well, now meet Henry in a bubble! When it comes to Lola, I open my wallet and give all my money to the vet. She just got her teeth cleaned last month. Ouch! So far, she hasn’t had to have too many expensive visits, but I can’t say no if she needs care. Lola is a cutie and a talented writer. She’s worth every penny! Monica, if you find you can put Henry on your insurance policy, let me know how! I’ve heard there are actual pet insurers now, but I don’t know how much that would cost. My sister has two Bichons, one of which had to have nearly every tooth in his head pulled out; talk about an expense! I’ve been brushing my Sheltie’s teeth in an effort to knock off tartar, etc. — and I sure don’t want to have him put under. Henry is adorable; who could resist that face?! Pet insurance is too limited and also costs a bundle. Plus, there’s no tax deduction. On the other hand, if I can find a way to put him on my health plan, then I’d only have to pay the office visit fee of $20 and everything else would be covered! Oh man, I hear you. With one giant dog and two cats, our vet bills are high. Cat was vomiting last month and so I shelled out almost $300 for tests, which came back negative. Nothing wrong with him, probably the dry food doesn’t sit well with him. Man 😦 We are crazy to pay these prices but what choice do we have? We love our pets and we are responsible for their health. Just like our children, how can you look at that face and not ante up? Just glad to hear it wasn’t anything serious. —Henry is your son…and must be on your insurance! He is gorgeous for one thing. & I’m so happy that he is healthy. Brava for Henry! I once got a voter registration card for my dog. It was an accident – but sounds like a good place to start. Henry needs his own health insurance. They have health insurance for dogs now, you know. It’s probably pricey but so is medical care. I have a Japanes Chine who has a dry eye problem and we see an eye specialist every few months to the tune of $200. Just yesterday I got the good news that we don’t have to go back for 6 months but we still need the meds. MT former dog had heart problems which cost me $800 every three moths. So far the puppy is not costing me anything–yet. Henry had his own insurance for two years. I dumped it after a year, when I figured out it wasn’t covering any of his actual ailments. He needed knee surgery and it wasn’t covered. That cost $2,500 and I’d been paying $50/month for the insurance. I figured out then, it wasn’t worth it.